Bork, Bork, Bork! It’s time for another Top 200 Photos. For the most part I was too young to catch the muppets on their first run. But Kermit was a reporter on Sesame Street when I was a kid and that resulted in my recognizing him when muppet movies were shown on TV. Eventually between reruns on TV and the web, I saw large portions of The Muppet Show and their various movies. 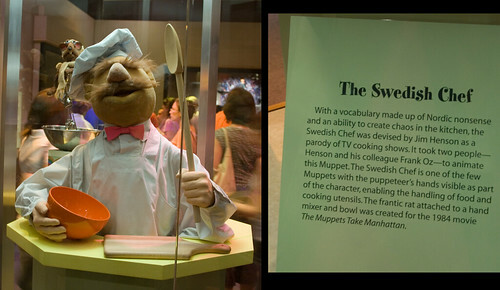 The Swedish Chef was not my favorite character, but he was in my top 10. This photo was taken at the Smithsonian when they were having a pretty big exhibit of Jim Henson stuff. I usually consider it pretty dumb to take photos of stuff in museums (especially paintings), but I made an exception in this case.